Please click on any of the days below to view the full agenda for each day. To download a PDF version of the 2019 Riviera Festival of Boating Timetable please click here. Bookings for the Workshops and Social Events require pre-registration. Pre-booked parking is also available at Sanctuary Cove for attendees of the Riviera and Belize Festival of Boating at the Sanctuary Cove International Boat Show but spaces are limited and must be pre-booked. We will require your Riviera or Belize Hull Identification Number (HIN) if you are purchasing tickets to this event. All Hull Identification Numbers will be verified by Riviera Australia. Single Day Parking Passes and Tickets for the social events (Ladies Luncheon and Gala Evening Events) – also need to be pre-purchased. Once you have completed your Registration, you will receive a confirmation e-mail with your workshop and social event booking details and will be required to print off your Single Day Parking Pass (if booked). You will be required to display your Single Day Parking Pass on your dashboard for entry into the Riviera VIP Car Park at Sanctuary Cove and our car park attendant will validate your entry. We will be providing a complimentary shuttle bus service (travel time 3-5 minutes) between the Riviera VIP Car Park and the InterContinental Hotel. Please note, your tickets to the Sanctuary Cove International Boat Show and Festival lanyards will be available for collection from The Riviera Concierge, at the InterContinental Hotel Sanctuary Cove, located just outside of hotel reception. The shuttle bus will drop you at our concierge. You will require your Festival lanyard for entry into all Festival workshops. It is recommended that you arrive at least one-hour prior to the commencement time of your first workshop to allow sufficient time for registration and to make your way to your first workshop. This popular, hands-on workshop will help you better understand the entire desalination process. You will gain a valuable insight into the various types of water-makers available and how to determine the best system for you and your family’s needs. This workshop also explains how to operate, maintain and service a water- maker unit to maximise the system’s potential and longevity. We will cover trouble-shooting exercises for existing desalination unit owners who want to be better prepared to diagnose possible in-field concerns. This workshop will be conducted by a SRC and HRO Desalination Systems Engineer. 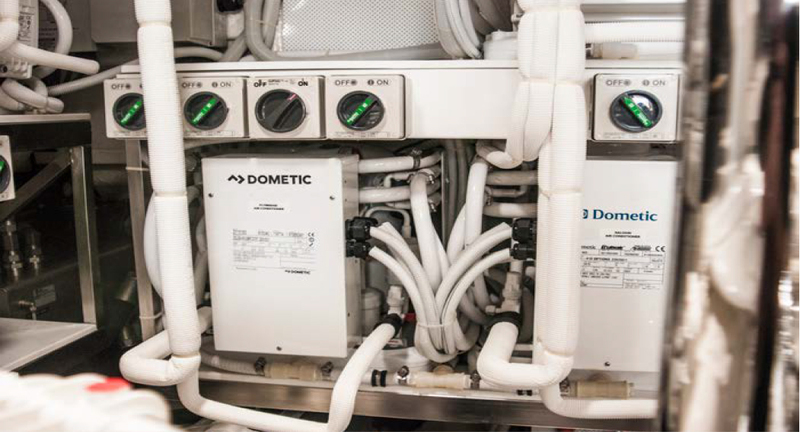 Sea Recovery (SRC) and Horizon Reverse Osmosis (HRO) were the world’s first manufacturer of economic water-makers for the boating industry and SRC / HRO desalination systems are used in 90 per cent of new Rivieras. 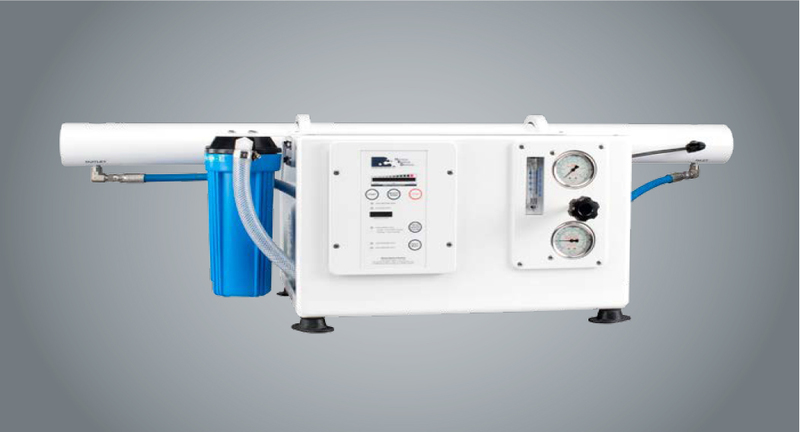 SRC and HRO’s parent company, Parker Water Purification, is at the forefront of desalination and purification systems. This workshop is a unique opportunity if you own a classic model Riviera built between 1980 and 2008. Tap the highly experienced Riviera team’s vast bank of boating expertise to ask any question about your classic motor yacht with its traditional systems and drives. The panel will address some of the most commonly asked questions. Then it’s your turn to raise any questions, ask for advice or discuss something that is of specific interest to you in an open forum where everybody can learn from shared knowledge and experience. This is your chance to learn from those who have helped chart Riviera’s course to be one of the world’s leading luxury motor yacht builders. Learn the professional tips and tricks to raft up with an anchored vessel, discuss the key considerations to ensure a safe towing scenario using knots, lines and hitches as well as coiling and throwing lines. You will also receive an overview of the best tow points for motor yachts and learn the difference between, bridles, fore, aft, breast and spring lines and the best use of lines for a long tow or side tow. This is a seminar for every motor yacht owner and their crew to develop greater confidence and enjoy safer boating. Includes coiling and throwing of a heaving line. In this seminar, Riviera and Belize family members have the exclusive opportunity to gain the Australian Waters Qualification with a fully accredited trainer. While all marine radio users (except those operating 27 MHz marine radio stations) must be qualified, boaters have previously been required to obtain a Certificate of Proficiency or an equivalent overseas qualification. Anyone operating a VHF marine radio without an appropriate qualification, or not under the supervision of an appropriately qualified person, may be breaching the Radio Communications Act 1992, and may be fined. This course outlines core VHF competencies, operating channels and how to access search- and-rescue facilities. You will be issued with a Certificate of Attendance and subsequently a Statement of Attainment for the AWQ. The assessment includes both theory and practical components. If you are looking to gain qualification and operate a VHF marine radio within 12 nautical miles of the coast, this new domestic qualification is a must. There will be an additional AU$25 charge for this course. This is your chance to experience the ease and immense capabilities of the Volvo Penta Inboard Propulsion System (IPS) first hand. 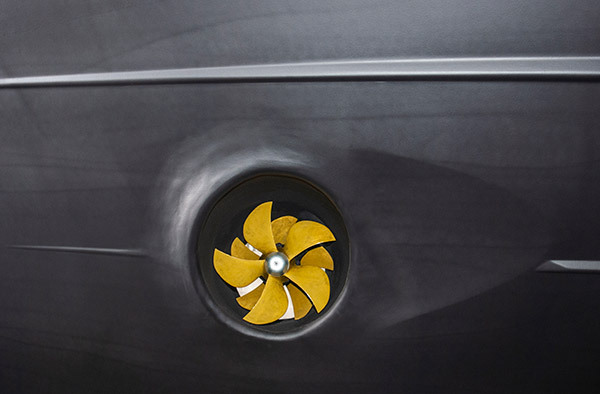 Volvo Penta has for many years been at the forefront of marine industry innovation through IPS. 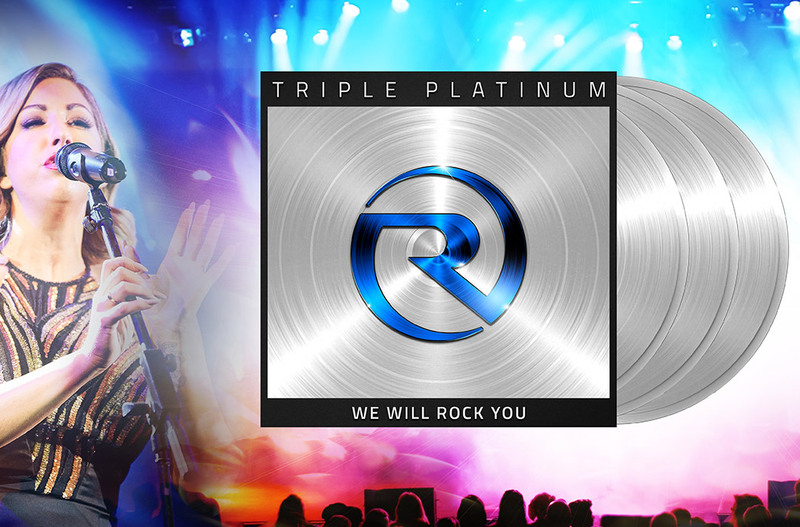 There are now more than 23,000 IPS units operating around the world, including on more than 700 Rivieras. Pod drives offer an excellent power-to-weight ratio, delivering improved performance, enhanced torque, improved fuel efficiency, unbelievable manoeuvrability, reduced environmental impact as well as smooth and quiet operation through under-water exhausts. This workshop offers you the opportunity to sea-trial a pod-driven Riviera and experience how IPS enables a skipper to control the yacht with ease, either through the wheel and throttles or a joystick. 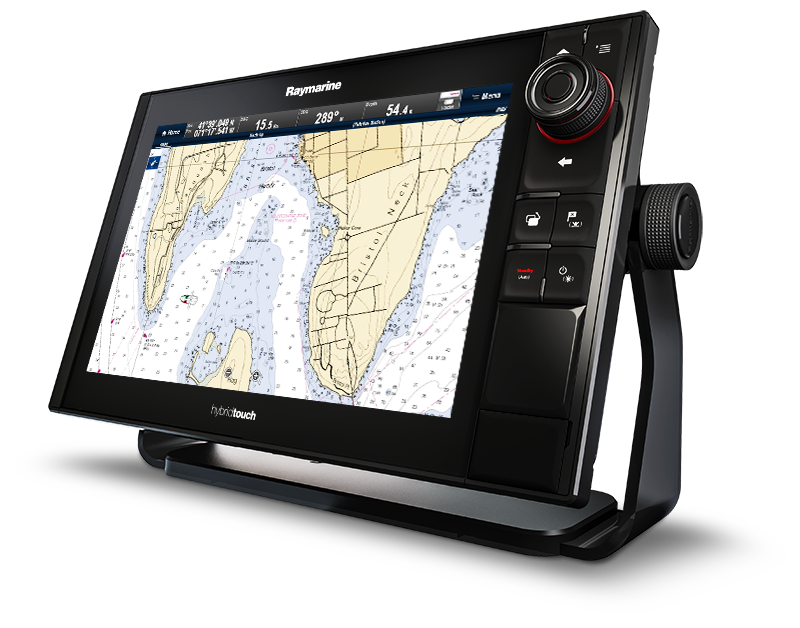 Collaboration with Garmin to develop the Volvo Penta Glass Cockpit centralised navigation and monitoring technology has driven considerable innovation. The Glass Cockpit integrates seamlessly with IPS and this workshop will demonstrate in a hands-on environment the considerable information it provides through intuitive touch screens. 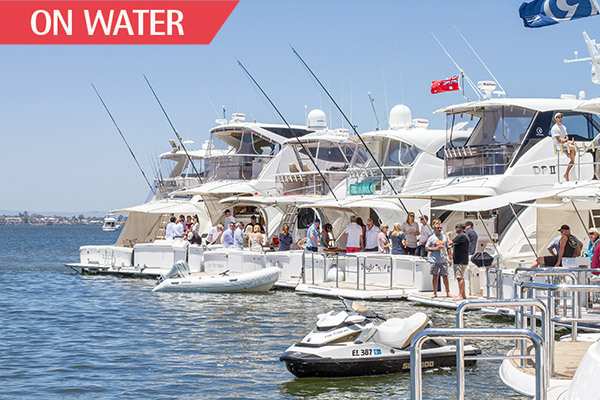 This on-water workshop will take place just off the Riviera Yacht Club and uses a small boat that will enable you to feel the Seakeeper gyro at work without leaving the marina. Gyro stabilisers greatly reduce boat roll and make time on the water much safer and vastly more enjoyable. Feel how they work and experience first-hand why they work so well. Such has been the impact of the Seakeeper gyro that a great many new Riviera motor yacht owners now insist they be factory-fitted. 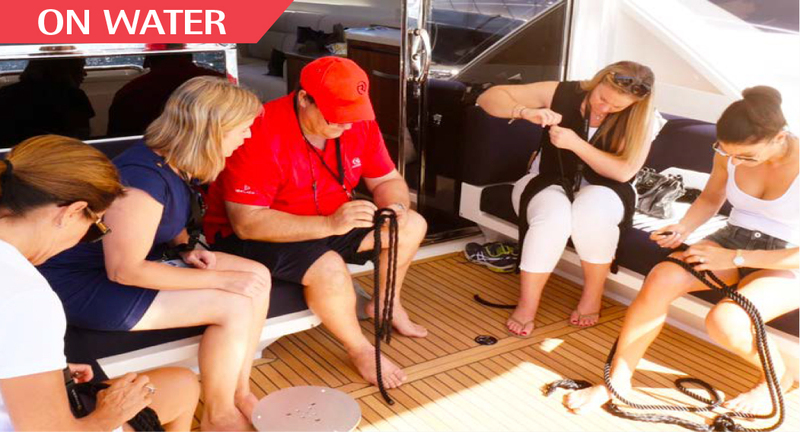 A Seakeeper can also be installed on board your current yacht by our expert Aftermarket team. Don’t miss this chance to see just how much difference a Seakeeper can make. Unlock the full potential of your CZone system in this very informative and detailed seminar. CZone’s Modes offers a predefined system state at a single touch. Modes will turn on or off specified circuits based on pre-programmed preferences in the mode of operation required. Wireless control via iPad, key-fob remote, programmable digital switches. CZone has a powerful ability to control your system anywhere onboard. CZone digital switching offers peace-of-mind by consolidating system information and presenting alarms when attention is required. Monitor tank level senders, fuel or temperature sensors or low power source voltage. CZone’s advanced monitoring ability means no irregularity in the system goes by without you knowing about it. CZone’s intuitive user interface makes it easy to find and filter the information or the controls you need. With larger complex systems a more in-depth understanding about how and why CZone does what it does can be very empowering. Here is a prime opportunity to gain greater insight and understanding of the CZone system. Our ever popular Tricks of the Trade workshop is back with even more information and advice. You will need to register early because this workshop is always in high demand and places are strictly limited. Conducted by highly skilled and experienced Riviera veteran Michael Swain from our Aftermarket division, this workshop walks you through everything you need to know about maintaining your motor yacht in ship-shape condition; from treatments for teak decking and exterior gelcoat protection to maintenance of flybridge clears, removing marks from upholstery, engine room cleaning and repairs. Feel free to ask any questions specific to your requirements in an open forum environment where you are encouraged also to learn from each other. Informative and fun, this workshop will help you develop greater confidence and enjoyment at the helm. 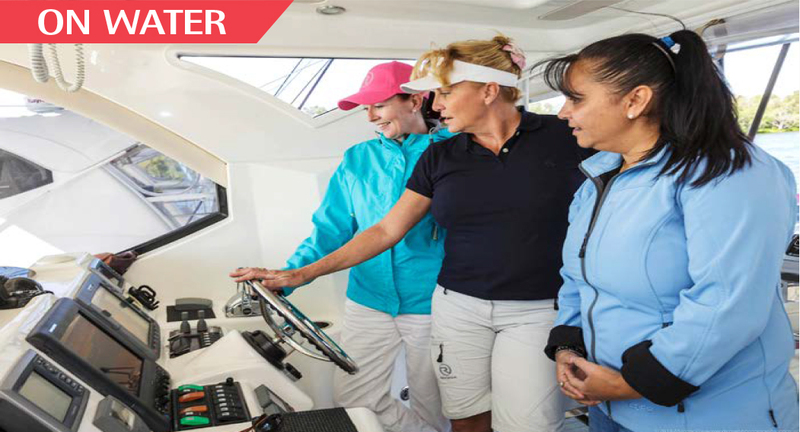 Widely credited within the Riviera family with boosting the confidence of hundreds of women on the water, this workshop is packed with valuable and practical skills. Topics include boarding procedures and safety equipment briefings for guests and crew, safety management of shore to ship’s power, skipper/crew communications, departure preparations and anticipating prevailing conditions. You will also gain an understanding of helm electronics, start-up procedures at the helm station as well as departure from and arrival at your berth. We show you how best to use gears, thrusters or a joystick, how to turn your yacht short-around on its own length while maintaining a proper look-out to meet collision prevention regulations. We also cover techniques for handling your motor yacht when coming into a marina, such as reading and anticipating wind and tide to achieve the best approach. The most common questions our team of experts are asked, refer to safe anchoring. This seminar explains the importance of vigilant assessment of the prevailing conditions, offering you practical techniques to ensure the efficient setting and recovery of your anchor. Our experts describe which types of anchors work best in specific situations as well as explaining options and scenarios to anchor to the seabed, sand, mud or coral, ensuring your motor yacht remains secure against wind, tide and current. Detailing the safe and correct use of your anchor windlass, bow roller and electronic chain counter operation showing the use and benefit of securing a Snubber line. You will also learn how to position your vessel up to a mooring buoy to safely pick up and secure a mooring line to your vessel using spliced eye or bow line loop. Includes eye-slice, bow line, rolling hitch and sheet bend. A faulty air-conditioner or toilet system is certain to upset an otherwise fun and relaxing time on board. 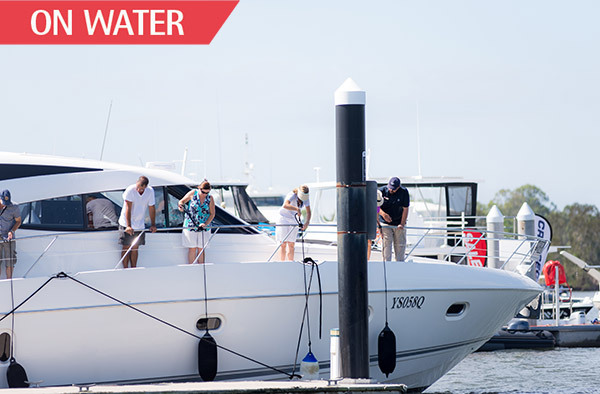 This workshop has been developed to ensure your time on the water is trouble-free. We provide an overview of air- conditioning systems, diagnosing issues, understanding the digital fault-finding process and protection of the unit. If you have ever suffered a blocked or faulty toilet system, you will also appreciate the additional focus in this workshop covering onboard sanitation systems and their key components. Hear tips and tricks for avoiding, troubleshooting and resolving common issues as well as advice on system maintenance and the spare parts and environmentally friendly detergents and cleaning agents you should always carry onboard. Join one of our most widely respected skippers, Tim Edwards, as he shares his immense experience and knowledge of crossing bar entrances, ensuring the safety of family and guests at sea and handling a planing hull yacht in varying sea conditions. Learn how to properly prepare and plan an offshore voyage, including adding fuel from bladders for extended range aboard your Riviera. You will also discuss the reasons yacht engines stop, diagnosing dirty fuel, overheating, broken belts, blocked sea strainers and broken impellers. You will receive a checklist of pre- departure processes covering batteries, spare parts and essential items to keep onboard, such as a spare freshwater pump. Books, charts, communications, GPS systems, fuel consumption and websites are also covered in-depth. This informative workshop is a must to attend for anyone planning to undertake coastal passage-making or extended offshore cruising. 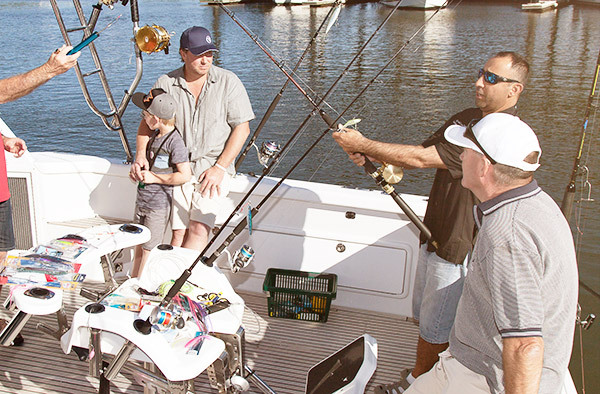 Hone your boat-handling skills and learn more from the experts. 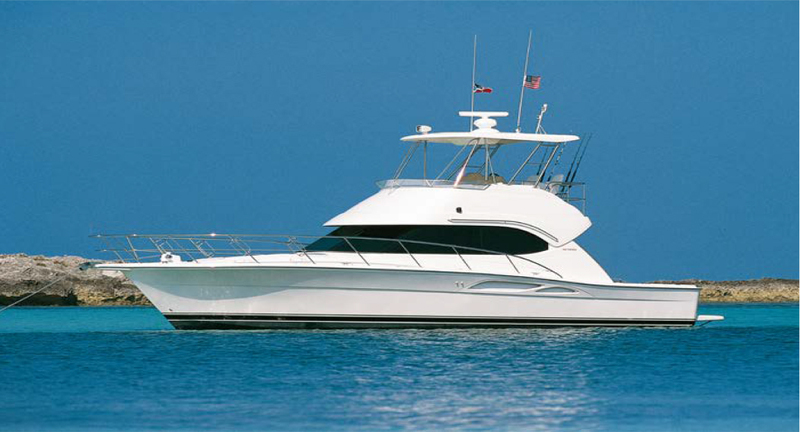 Perhaps you are relatively new to the wonderful world of motor yachts with the Riviera family. This very thorough hands-on workshop has been developed specifically for you. Our team describes correct boarding procedures and safety equipment briefings for guests and crew, safety management of shore to ship’s power, skipper/crew communications, departure preparations and anticipation of prevailing weather conditions. You will also gain an understanding of helm electronics, start- up procedures at the helm station and departure using gears, thrusters or a joystick. We also show you how to turn the yacht short-around in its own length while maintaining a proper look- out to meet collision prevention regulations as well as returning to a berth for docking, taking into account prevailing wind and tidal conditions. Have you ever stood in awe as another skipper seems to secure a motor yacht without effort or haste? This workshop is for you! It is better to know a knot and not need it than to need a knot and not know it – so goes the old adage which inspired this workshop. In this course you will learn all about ropes, knots, fenders and line-work. We will show you how to use spring lines to help manoeuvre your vessel to and from the dock with varying wind and tidal influences. Our aim is to help you enjoy the process of preparing and securing lines for berthing, rafting and mooring and to show you the professional look when you are securing your luxury motor yacht in her berth. Includes Round turn and 2 half hitches, cleat hitch and bow line. 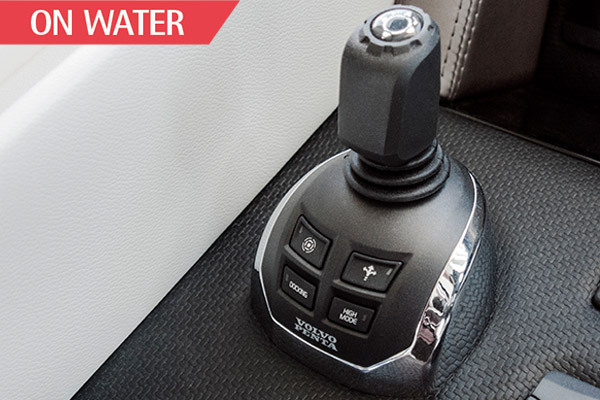 The innovative Express Joystick System developed by Twin Disc revolutionises the docking and slow-speed manoeuvring of shaft-drive motor yachts. With fingertip control, skippers can smoothly and simultaneously actuate and control engines, transmissions, propellers and thrusters. In this hands-on workshop, you will feel and see first-hand the EJS system in operation, providing effortless control in any direction, even pivoting on its own axis. The Express positioning system provides effortless station keeping with just the touch of a button. 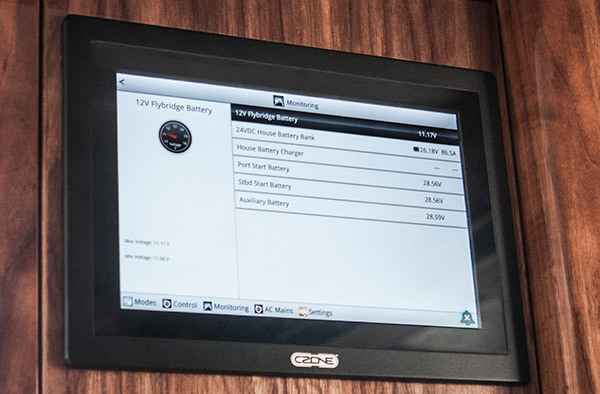 A dedicated GPS determines your location and heading, then instantly directs the Quickshift transmissions and proportional hydraulic thrusters to maintain these coordinates The EJS and EPS is favoured by owners of our largest Rivieras and is a standard feature of our new Riviera Sports Motor Yacht collection. 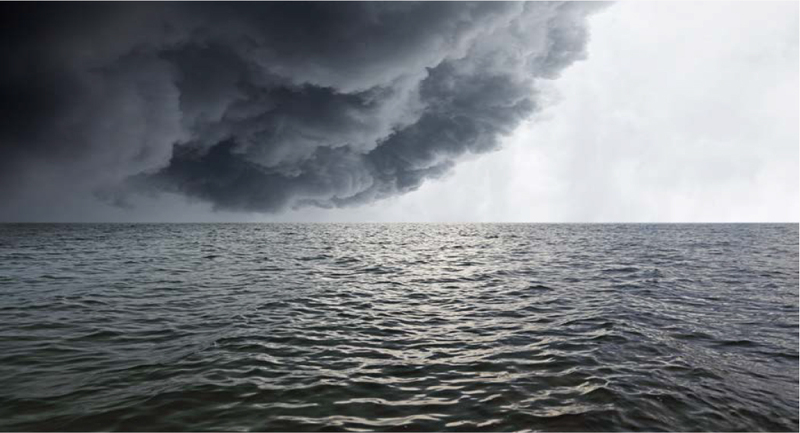 Choosing a “weather window” before you set out can mean the difference between an uneventful time out on the water or not. Join one of Australia’s leading thunderstorm and severe weather meteorologists to learn more about the nuances of daily weather patterns and signs of change so that you and your crew can more accurately forecast weather conditions. After this workshop, you will understand more about the factors that influence your cruise such as wind, wave and tidal conditions, and the importance of knowing where and how to reach shelter quickly. The workshop covers synoptic charts, weather and climate terminology, basic cloud types, fronts, cyclones and tropical cyclones, as well as where to access the latest forecasts, and the preparations and weather checks you should make before setting out. 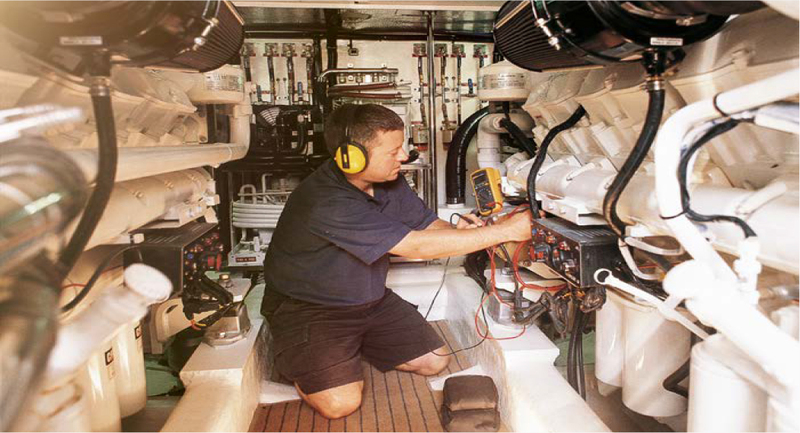 The genset on your motor yacht is often a piece of equipment that we set and forget. 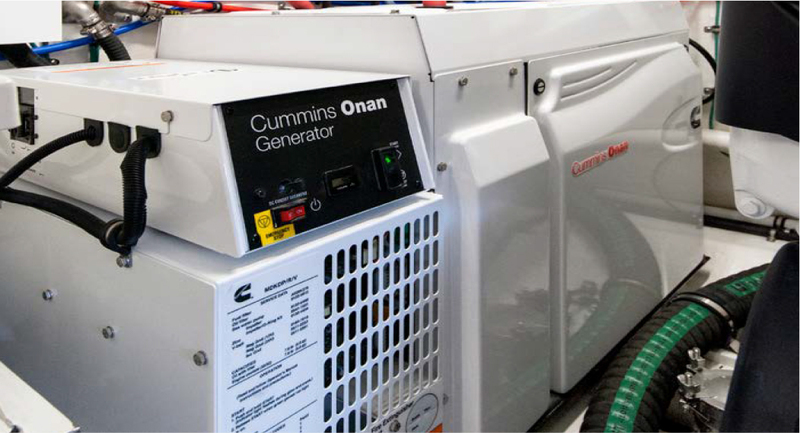 Understanding the key components, design and layout of your generator will give you new-found confidence while enjoying your time on board, whether you’re overnighting or undertaking an extended coastal cruise. Learn valuable insights from the experts on correct operation procedures of a genset and the inspections and maintenance you should carry out at regular intervals. The workshop will also cover fluid levels, cable and hose checks, exercising your generator for improved starting, reliability and longer engine life as well as replacing fuel filters and impellers and tensioning a V-belt should unforeseen problems arise. We also discuss fault codes as well as protecting your set from electrolysis. Fishing is widely recognised as a life-long learning process so it doesn’t matter if you are a novice or an avid angler, here’s your chance to learn new tips, tricks and techniques to increase your strike rate. Learn about rod, reel and line selection for fishing inshore and offshore for the species we all love to catch and eat. Learn successful new methods to target pelagics as well as the savvy sights and sounds that indicate there are trophy fish on the prowl. Learn how to catch and tie mud crabs, how to successfully fish for whitehead and flathead using soft plastics - this workshop covers it all. 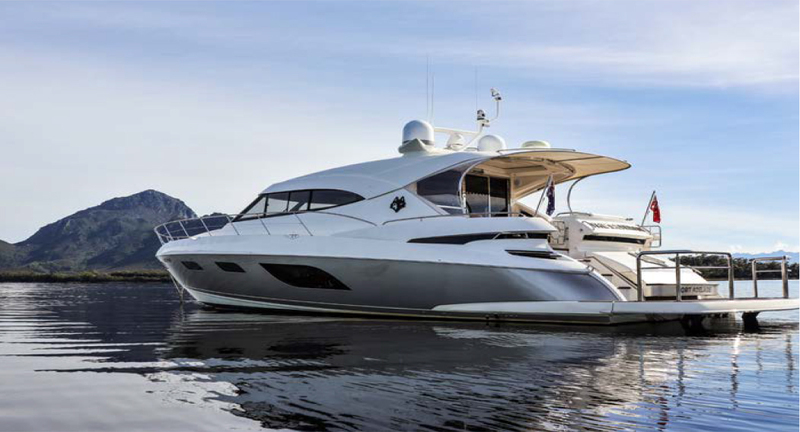 One of the most important yet least understood aspects of luxury motor yacht ownership is anti-fouling the hull. This essential area of routine maintenance has a direct impact on the fuel-efficiency and cruising speed of your yacht, yet there are no current Australian standards. This workshop aims to answer all the questions you have about anti-fouling. What is anti-fouling and how does it work? What does it do, and what doesn’t it do? Which types of organisms are you likely to encounter in your home waters? What are the essential anti-fouling processes so that you can make sure your anti-foul is up to scratch, and how much paint is needed for your own yacht? We also explain how best to take care of your yacht once it is back in the water so that you can make the most of your anti-foul investment. 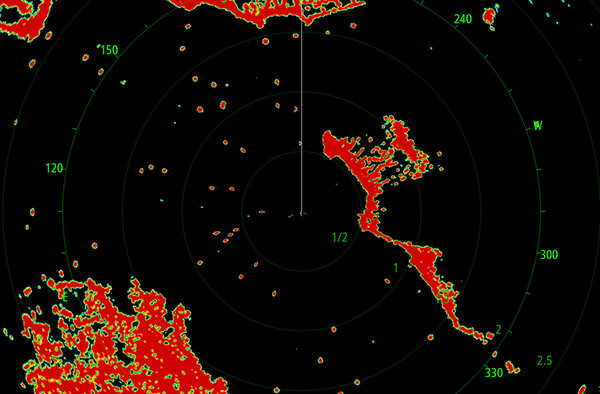 Modern Radar is much more than a system to avoid obstacles and hazards. This highly informative and hands-on workshop will provide you with an understanding of how to fix a position using electronic bearing lines, variable range markers and a Radar overlay, as well as how to identify surroundings, vessels, targets and obstructions in your vicinity through conventional radio transmission. 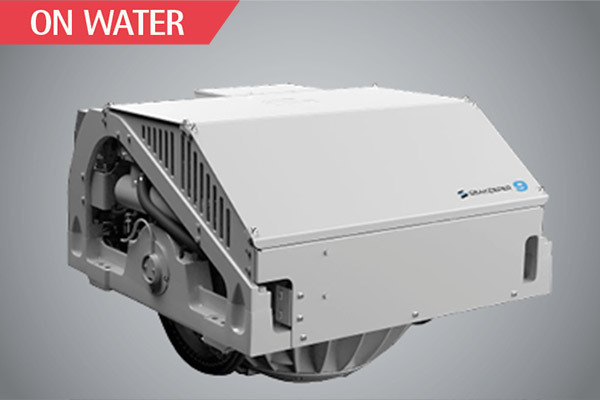 Understand how modern Radars synchronise with GPS and AIS so Radar can have the capabilities of GPS for electronic chart display and information systems. You will also undertake practical Radar plotting exercises. Using plotting sheets, learn to plot simulated targets and calculate time, bearing and ranges. Learn to find your “Way of Own”, “Way of Another” and to calculate and alleviate the risk of collision. Identify the “Closest Point of Approach” and “Time to Closest Point of Approach” and calculate the expected time for a rendezvous. Onboard power management is more important than ever as we increase the demands we make upon our motor yacht’s electrical systems. There are lighting and air conditioning systems, entertainment and electrically-operated sunroofs as well as navigation and communications. There is also our desire to be as well connected on the water as we are at home. This informative workshop will provide an in-depth understanding of charging systems, shore power, battery banks and LED lighting systems. This seminar has been created to empower all Riviera and Belize owners, whether they are taking ownership of a brand-new yacht or upgrading a classic model. Starting with an explanation of the latest technologies, followed by basic operation principles, this seminar takes you all the way through to understanding, operating and maintaining your electrical system. Navigating your motor yacht at night may seem at first a daunting experience. In this highly informative workshop, Karla sets out to demystify the task. 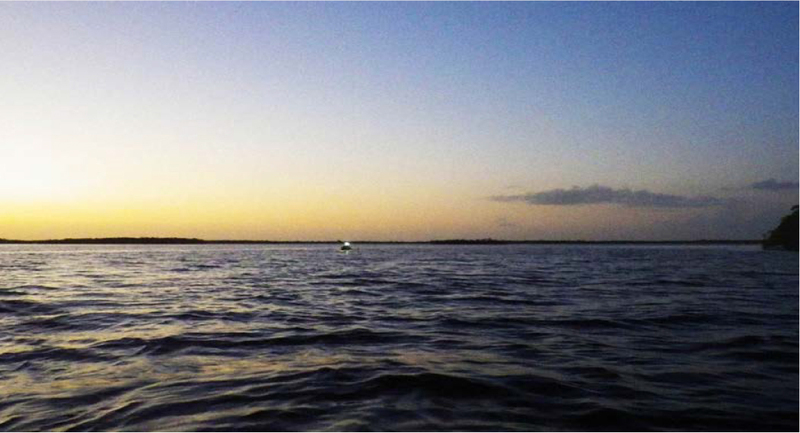 Certainly, night navigation requires particular skills and knowledge, especially the identification of navigation lights from the clutter of background lights. This course will outline how to keep a proper lookout at night and how to identify vessel types and sizes, direction, speed and distance. Karla also shows you how to calculate the relative positions of other vessels and know who has priority passage. A fusion of exotic textiles and unbridled colour will be on full display at our annual Ladies Luncheon on Friday, May 24. Amid the grandeur of The Grange at the InterContinental at Sanctuary Cove, you will be delighted by the signature kaftans of the latest Autumn/Winter 2019 collection from Australia’s own Bonita fashion label. 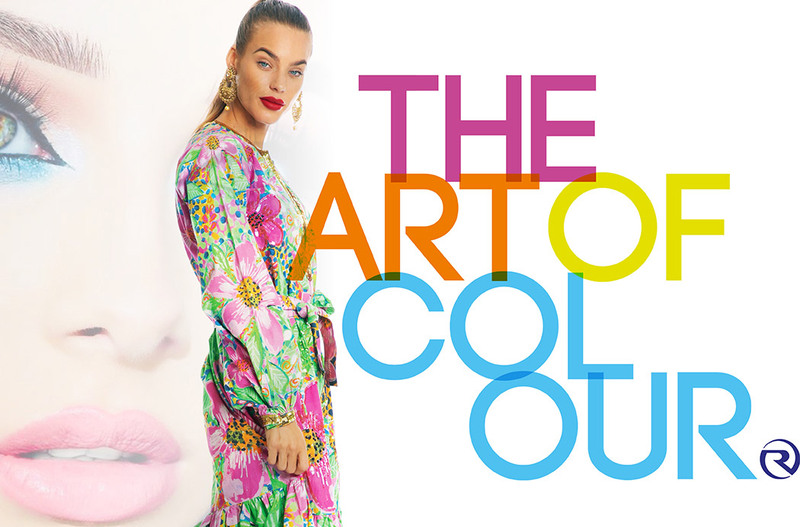 Bonita owner and designer Kristian Williams will host a fashion showing during the luncheon while Issada colour consultants will be on hand to offer guests an opportunity to sample the colourful make-up. Cost: AU$150 per head, includes lunch, sparkling wines and fashion presentation. Each guest will also receive a complimentary Riviera Gift Bag. David and Lis Paton have been cruising the enchanting waters of Tasmania since 2015, spending up to four months at a time on board their Riviera 53 Enclosed Flybridge Pascua Lama. "About half our time on board is spent with friends," says David. "It gives them an opportunity to view this magical island from a perspective they would never normally have, one that we have had the joy of experiencing over and over again. And we never tire of any part of it." David and Lis will share their fascinating experiences with Riviera and Belize owners during their "Living The Riviera Dream" presentation at the InterContinental Sanctuary Cove Resort on Saturday, 25 May. They will discuss passage making, meal planning and preparation, heavy weather navigation as well as the many surprises and delights of Tasmanian waters. "It does demand a strong sense of independence and a great deal of preparation," says David.. "Whatever may go wrong you need to be able to fix yourself." Among their many adventures, David and Lis will describe their voyage into Hobart through the Denison Canal, meeting "literally thousands of dolphins" in Wineglass Bay and battling five to six metre swells off the south coast as they made their way to Port Davey on the west coast. The return for their efforts was enormous. "Magnificent views, great adventures and fantastic fishing," says David. This advanced workshop will help you take total command of Volvo Penta’s state-of-the-art Glass Cockpit navigation and monitoring system. The Glass Cockpit provides a complete overview and control of both engines and navigation – all in one place and within the one system. Our experts will provide advice on how to access, understand and realise the full potential of all of the settings and data available through this very comprehensive yet easy-to-use system. We will discuss in great detail all elements of the system including Global Positioning System, sounder and Radar, as well as auto-pilot and charts. 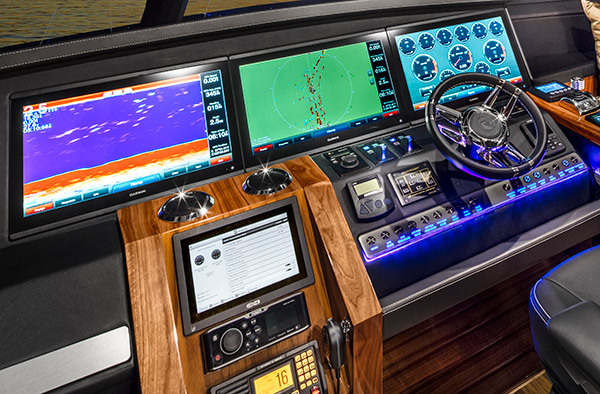 Fully integrated with Volvo’s Inboard Propulsion System (IPS) and Electronic Vessel Control (EVC), the Glass Cockpit puts the latest features at your fingertips, including the unique Auto Guidance feature that searches through all relevant charts to create a route you can follow to avoid shallow water, buoys and other known obstacles. Have you ever stood in awe as another skipper seems to secure a motor yacht without effort or haste? This workshop is for you! It is better to know a knot and not need it than to need a knot and not know it – so goes the old adage which inspired this workshop. In this course you will learn all about ropes, knots, fenders and line-work. We will show you how to use spring lines to help manoeuvre your vessel to and from the dock with varying wind and tidal influences. Our aim is to help you enjoy the process of preparing and securing lines for berthing, rafting and mooring and to show you the professional “look” when you are securing your luxury motor yacht in her berth. Includes Round turn and 2 half hitches, cleat hitch and bow line. 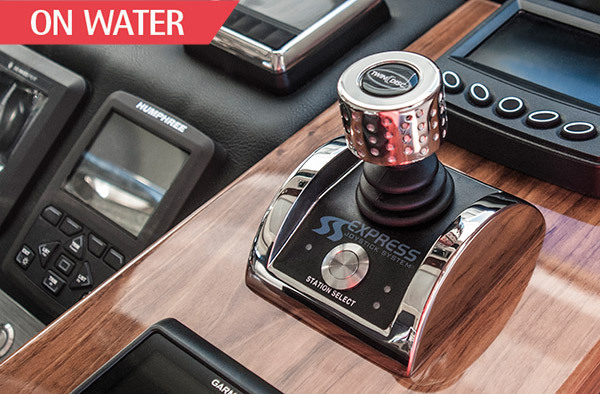 The innovative Express Joystick System developed by Twin Disc revolutionises the docking and slow-speed manoeuvring of shaft-drive motor yachts. With fingertip control, skippers can smoothly and simultaneously actuate and control engines, transmissions, propellers and thrusters. In this hands-on workshop, you will feel and see first-hand the EJS system in operation, providing effortless control in any direction, even pivoting on its own axis. The EJS and EPS is favoured by owners of our largest Rivieras and is a standard feature of our new Riviera Sports Motor Yacht collection. This workshop shows you how to explore the wealth of free information now available that will help you predict rain, storms and winds with the guidance of our expert meteorologist who provides critical forecasts for clients right across Australia. Delve into the valuable features of Radar and how to read synoptic charts to forecast weather conditions. You will learn more about analysing long-term signals and weather patterns as well as take part in in-depth discussions on terminology and cloud types. If you want to learn more about being able to choose your times to cruise in better weather conditions, this seminar is a must for you. Cost: AU$95 per head, includes champagne and fine wines, hors d’oeuvres and live entertainment. Children (under 18) AU$40 per head. Please note – there is no shuttle bus service for the Friday night Gala Event. Complimentary parking at Sanctuary Cove, can be reserved for these events at the time of booking. parking for this event is only available after 6pm. Spaces are limited. The safety of your family and guests are paramount to enjoying your time on board. This comprehensive seminar will provide you with the skills and know-how to safely and confidently respond if ever you need to deploy life jackets, flares or even a life raft. Gain an in-depth knowledge of the emergency equipment and supplies stored in life rafts and learn how to launch and right a life raft in a real-life practical inflation demonstration. Our presenter will also discuss a range of emergency protocols including how to respond in a man-overboard situation. The seminar includes a valuable component on life jacket (Personal Floatation Device) standards and outlines your legal requirements, and how often life jackets should be checked and replaced. Learn about the different types of PFDs that are available as well as the features and benefits of inflatable versus traditional life jackets. A special focus on flares will outline the various types of flares and when they should be used. You will also have the opportunity to participate in valuable exercises of live-firing flares. Marine radios have save lives so it’s important that you know how to use the radio aboard your motor yacht and the correct channels to use. Our seminar provides all this key information as well as showing you how to use your marine radio for a variety of services to small vessels, including weather and navigational information. 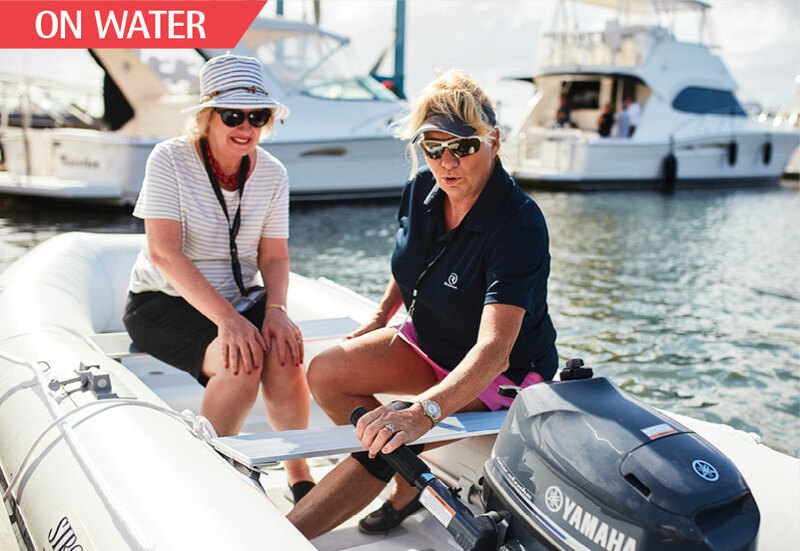 This workshop is highly relevant for those new to boating and those wishing to enhance or refresh their knowledge of all the rules, regulations and options should you be faced with an on-water breakdown or emergency. This workshop will outline procedures for alerting rescue authorities if you are in distress, radio communications, digital select dialing and how and when to call for the Coast Guard’s Marine Assist service. We also cover the SafeTrx smartphone app that allows you to have your journey recorded and monitored by the Australian Volunteer Coast Guard 24 hours per day, every day of the year. Using this app, you can enter your journey details directly on your smartphone and set out knowing that, should you not return by a given time, the Coast Guard response team will be alerted and initiate action. 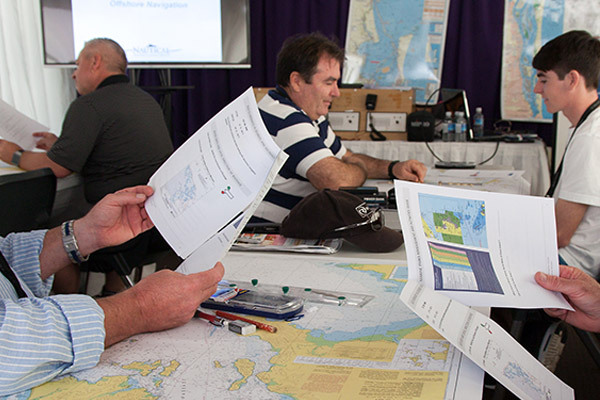 The workshop also outlines the new Australian Waters Qualification for short-range (12 nautical miles) VHF. And we cover connecting a GPS to your radio, the unique nine-digit Maritime Mobile Service Identity (MMSI), and Automatic Identification System (AIS) tracking. 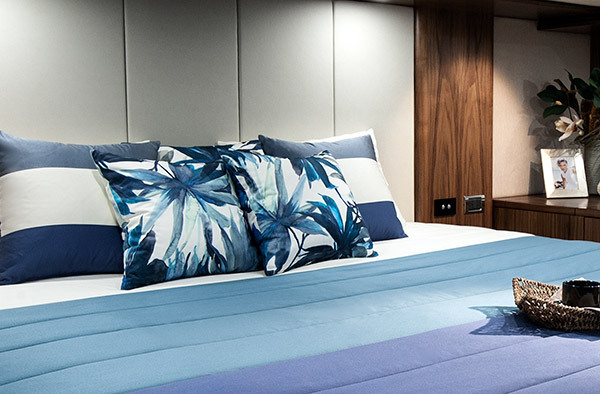 Whether you are preparing to take delivery of a brand new model or refurbishing your current Riviera, much of your onboard comfort and enjoyment lies in the personally selected fabrics and the décor you choose. In this highly informative workshop you will discover the key considerations and interior design secrets when selecting upholstery, fabrics and soft furnishings. From lounges and scatter cushions to bedheads, bed linens and covers, you will learn about colour-matching, fashions and trends to help navigate between classic neutrals and vibrant colour combinations to suit your individual personality. A special focus will be on the unique properties and superior UV and weather protective performance of the Sunbrella range of fabrics, used in Riviera cockpit lounges and sunpads and now selected also for the internal fabrics in selected models. This workshop is a must for those wishing to keep up with the constantly evolving world of marine navigation and electronics. 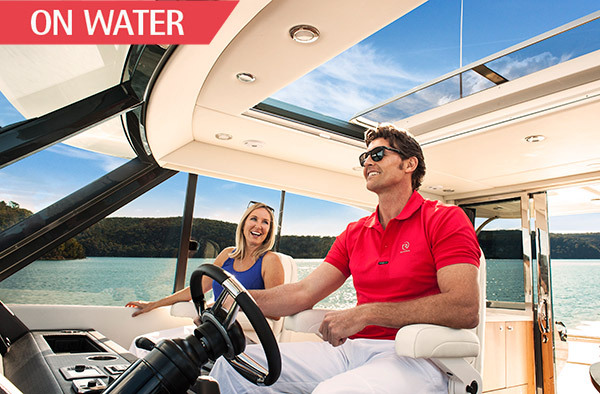 As one of the world’s leading marine brands, Raymarine will provide an invaluable insight into the latest technology, and explain how to realise the full features of your existing technology. Topics covered will include understanding radar, understanding how to mark fish using fish-finders as well as chart-plotting and operating the autopilot. This workshop will also cover the benefits of innovative thermal imaging and the integration of smartphones and tablets with your yacht’s operating systems … and much more. 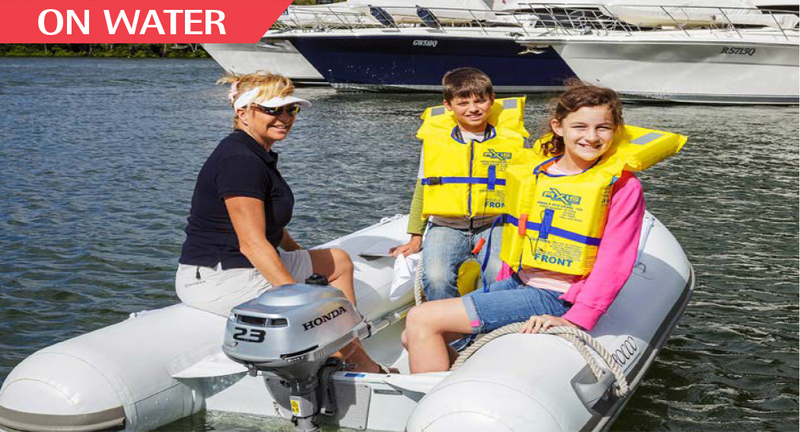 Highly recommended and very popular among budding skippers - aged six to 12 years - this informative and fun workshop is a must for the kids and grandkids who share our love of the boating life. With a heavy focus on safety and tenders, this workshop covers pre-departure checks, safety equipment, the importance of letting someone know before you go, man- overboard procedures, tender limits and understanding tender and crew limitations. We also demonstrate steering, embarking and disembarking, manoeuvring, berthing, anchoring, marine signs and rules and the need to check wind and tide conditions as well as general tender care tips. We also cover the important knots and hitches, how to create an eye splice and to secure a fender with a round turn and two half-hitches. 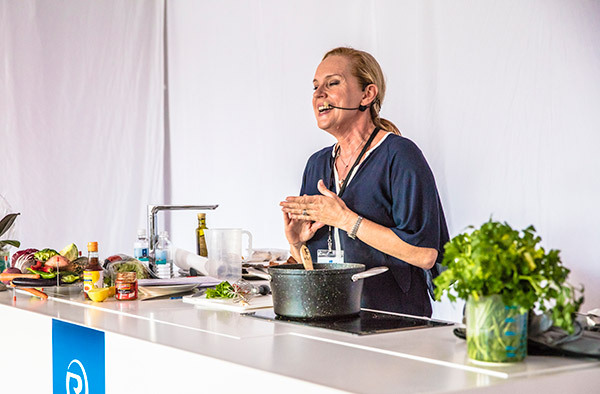 Professional chef and author Sally Jenyns will again present our very popular Galley-Wise workshop. Sally will utilise Riviera galley appliances including a Miele convection microwave oven, three-burner hotplate and barbecue to demonstrate the art of alfresco entertaining while ensuring family and friends on board are well and delightfully nourished. Wine varieties will be recommended to match the various dishes she prepares with speed and ease and even show you how to bake fresh bread on board. She will reveal tips and tricks for menu selection, fresh food storage, food preparation and meal planning. This entertaining and highly informative presentation is certain to be in great demand, so register early. This workshop will cover the components of a tender, its stability and various steering techniques required for both outboard tiller and wheel steering control. Learn the correct ways to run up onto a beach and come alongside a boarding platform as well as safe embarkation and disembarkation from the tender. In the event of a man-overboard incident, it’s important to know that the safest method of recovery is from a tender, not a larger vessel. Learn the techniques to read currents, wind and effective retrieval to recover someone in distress - possibly unconscious - from the water. Please note – there is no shuttle bus service for the Saturday night Gala Event. Complimentary parking at Sanctuary Cove, can be reserved for these events at the time of booking. parking for this event is only available after 6pm. Spaces are limited. There are no workshops on Sunday, however you can book your Sanctuary Cove International Boat Show admission tickets. Please note – there is no shuttle bus service for the Gala Events. Complimentary parking at Sanctuary Cove, can be reserved for these events at the time of booking. parking for this event is only available after 6pm. Spaces are limited.